Discover the magic of electronics textiles! Make your own ElectroPUFF Lamp Dimmer with this fun, easy and educational craft kit. The ElectroPUFF Lamp Dimmer is a soft, whimsical pompom that controls any incandescent table lamp with just a gentle tap. By combining colorful recycled carpet fibers with special conductive yarns that sense your touch, you'll create a truly unique object that's as much fun to make as it is to use! Fun & easy for everyone! No knowledge of electronics is required. Perfect for kids (ages 6 to 100), crafters, science enthusiasts, educators, techies and anyone who loves to work with fabric. As safe as plugging a lamp into a wall. Learn about the magic of e-textiles and basic properties of electricity with our educational data sheet. 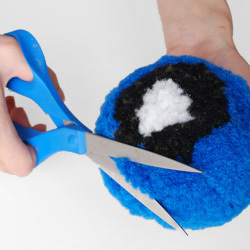 Contains all the materials you need to make your ElectroPUFF, including all the yarns, pre-assembled electronics, reusable pompom maker & embroidery needle. Our patented electronic textile technology is the magic behind the ElectroPUFF. Both the kit and the completed ElectroPUFF make great gifts, but you'll want to be sure to keep one for yourself - they're so fun to use!